WHAT ARE THE SIGNS OF CARPET BEETLES TO LOOK FOR? Can they cause severe allergic reactions? Will throwing infested items in the dryer kill carpet beetles? How long do carpet beetles live? Do carpet beetles fly or only crawl? Do you think that you’ve got a carpet beetle problem at home? Have you spotted damage on your rugs but you’re not sure what’s caused it? Then, you’ve come to the right place, because we will help you figure out the ways to identify and prevent these nasty pests. You’ll also learn how to get rid of carpet beetles for good, as well as what types of beetles there are and their habits. Essential info for you to deal with them! Carpet beetles come in different colours and sizes, depending on what species they are. There are some tiny representatives (about 3-mm), such as the varied carpet beetle and the furniture beetle. And there are some much larger ones, like the fur and the leather beetles, reaching 6mm and 10mm, respectively. They all have six legs and are either red, brown, black or patchy with white and yellow scales. Adult carpet beetles usually hang around outdoors to eat and mate but they would head somewhere indoors to lay their eggs. In that respect, it’s the larvae that can cause severe headache. Young larvae feed exclusively on textiles and other organic materials (both man-made and not). On that note, a “grown-up” beetle eats mainly plant nectar and pollen. 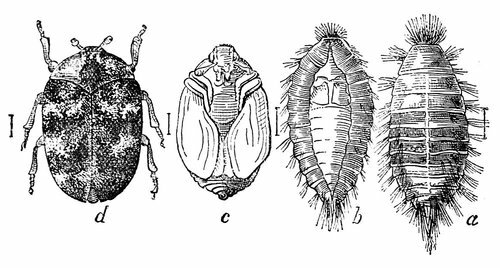 The life cycle of carpet beetles also varies, depending on the type of subspecies, temperature and overall environment conditions. Some will live from a few weeks up to several months while others – up to 3 years, such as the varied carpet beetle (more on that bellow). This subspecies is relevantly small in size, ranging between 0.3 and 0.5 cm in length. The grown-up adult has a round-like body with contrasting black, white and vivid pastel colours. The furniture carpet beetle has 6 legs as well and is often mistaken for its cousin – the varied carpet beetle. Only a quarter of a centimeter long, the varied carpet beetle is the smallest of the three with only 6 legs. Colour-wise, it has a palette similar to the furniture carpet beetle. Significantly larger than the previous two, the black carpet beetle can grow to over a centimeter. Compared to the rest of the family, its body is slightly elongated, and the shell is black. Despite having similar names, both species are quite distinct from each other. Carpet mites are the type of dust mites that live in your carpet and – surprise – are not insects at all. Carpet mites are 6-legged arachnids too small to observe with the naked eye, which allows them to live practically anywhere in your home – in the sofa, carpet, drapery, mat or even a filthy rag. Will carpet mites bite living beings? Certainly not. Could they trigger an allergic reaction? They certainly could. However, the important note here is that carpet mites are not carpet beetles. Now let’s move forward. As we’ve mentioned above, to sustain the colony and reproduce successfully, carpet beetles lay their eggs near a food source. 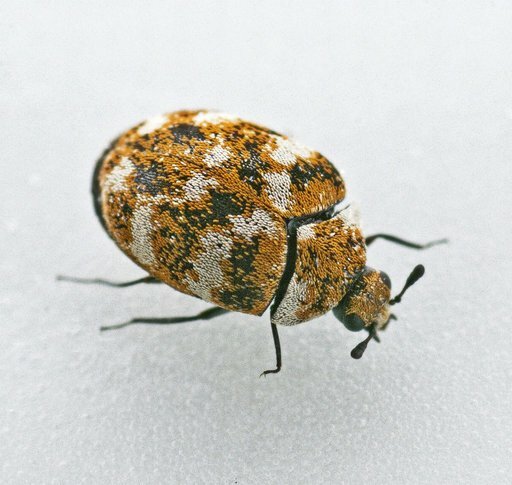 In other words, carpet beetles will infest the interior of a building, as long as it offers plenty of organic material such as: woolly carpeting, rugs, blankets and clothing, cotton fabrics, silk tapestry, leather upholstery, fur coats, and even a mounted mammal collection at Liverpool Museum. 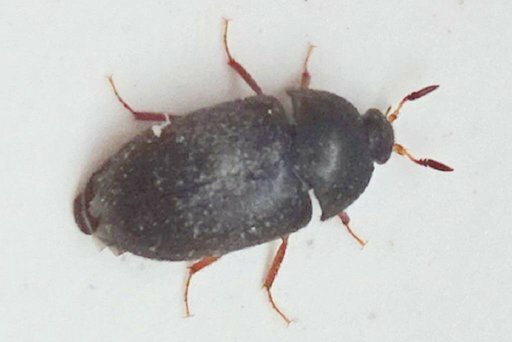 This means that you can expect carpet beetles to feast in your wardrobes, linen cupboards, upholstered furniture, as well as on your carpets, rugs and blankets. 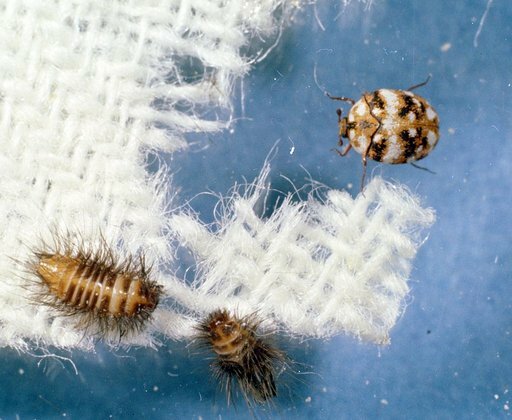 Some carpet beetle species’s larvae will attack almost anything organic, ranging from pet hairs, feather-filled pillows, skin flakes, dead flesh of animals and dead insects to dry flowers and human or pet food. In that sense, you can spot signs or damage throughout your entire home – in your kitchen cupboards, pantries, as well as on any surface contaminated with the types of organic matter mentioned above. Outside residential properties, carpet beetles can be also found in textile factories, furniture and carpet warehouses, food production facilities, hotels, libraries, antique shops, bookstores, galleries and natural history museums, as well. As adult carpet beetles rarely hang around the house for long, the first sign of pest activity you’ll spot is probably the damage larvae cause. These would be holes in your carpeting, clothes, upholstery, linen, blankets, ruined book covers and food packaging, wrecked fur rags, coats and collars; as well as leather furnishings. Furthermore, near the area of “action”, you may sight small heaps of bristle skin sheddings, left behind by moulting larvae. Also, excreta can be seen on closer inspection, but only if you have an eye for detail. You may also notice life specimens of young carpet beetles – the larvae, which are big enough to spot (5-8mm in size) if taken by surprise before they sneak into some hidden place. And as for signs of adult beetles, your window sills are the place to look for. You may see them trying to get out after they have laid their eggs. Once you’ve discovered the signs of a carpet beetle infestation, equip yourself with one of the carpet cleaners we recommend, or a vacuum cleaner and thoroughly clean/vacuum the affected area. If that isn’t enough, resort to a professional heat treatment for a 100% guarantee against carpet beetles, bed bugs, moths, fleas and even roach eggs. Infested clothing and fabric items should be washed at high temperature or dry cleaned. But if badly damaged, simply discard those for good. The latter applies to infested food, too. Then, spay the surfaces with an appropriate insecticide by reading carefully the manufacturer’s instructions, regarding usage and safety. Also, you can generously sprinkle some Boric acid powder, be it on carpets, soft furniture or inside surfaces of storage units. Leave for a while to work its killing magic and vacuum again diligently to remove the product residue along with any pest activity remnants. 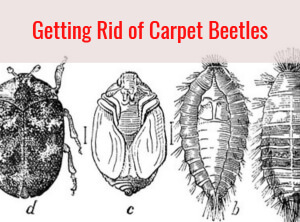 Unfortunately, there is no easy way to get rid of carpet beetles naturally. As we all know, prevention is the best cure there is. In that sense, we can safely say that the above-mentioned techniques for getting rid of carpet beetles can be used for prevention too. Or in other words, if you stay vigilant and check your textile fabrics and possessions regularly, along all hard-to-reach places and storage units, you’ll be able to spot the signs of a pest infestation before the onset of a real problem.. The same goes when it comes to frequent vacuuming of floorings, furnishings and inside cupboards and wardrobes. Also, you can spray with an insecticide or use boric acid for prevention as well. A good precaution is the use of steam mops or a hand-held multi-purpose pressurised steam cleaner. In addition, you can minimise the risk of a possible carpet beetle infestation by using synthetic floor coverings, furnishings and linen. Store away securely clothing, made from fur and leather and seal gaps and crevices that can be used by adult carpet beetles to enter your property. Last but not least, always inspect second-hand items (clothes and furniture), as well as plants, you’ve bought from your local garden centre, before placing them inside your home. Yes. Carpet beetles are known as a source of allergens, more specifically, their dead skin sheds and hairs. However, you will have to thoroughly vacuum your entire home top to bottom and also look into air purifier specially designed to tackle allergies and cleaning products for both carpets and upholstery. If left on cycle for long enough, yes, your dryer will kill the bugs. However you’ll have to get rid of their leftovers as well. Larvae eggs take anywhere between one and five weeks to hatch, while adults could live up to two years. Technically, carpet beetles do have wings but only when they reach adulthood. Add their size and weight and flying becomes a huge advantage.